Olive garden nutrition parades the virtues of this humble fruit. 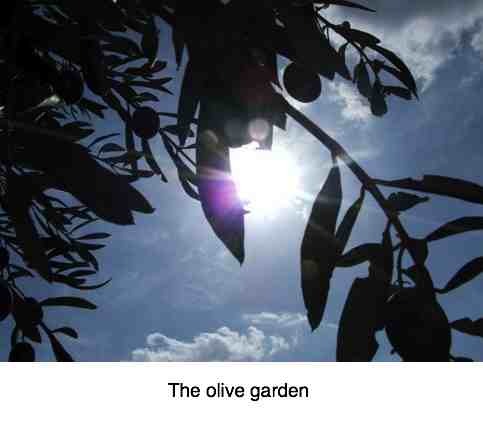 Olive garden nutrition allows me to discuss a few of the advantages of this humble Mediterranean fruit. This page was last updated by Dr Barrie Lewis on 9th April, 2019. Here are some fascinating facts and figures to ponder. Allow me as a chiropractor to parade a few of the virtues of the Mediterranean way of eating, and why it is important for you, the patient; vital for me, the doctor, too. Despite what you might read in the popular press, fats and oils are essential in our diet. It's not the marvelous, good foods like the olive and avocados that cause obesity but usually simple carbohydrates and those starches with a high glycemic index. It's the refined flour, white rice and sugar, for example, that invite a powerful insulin response. From our first few mouthfuls of mother's milk which is rich in fat, humans require food that is loaded in certain essential fatty acids since they are the chief component of the brain and all nerves. It's the fruit oils, not those from seeds, that are particularly rich in the healthy oleic, but they lack omega 3; both are needed for a strong and fit body and mind. Here's an interesting aside. If you want your infant to grow as fast and big as a calf, feed him or her cow's milk. If on the other hand, you want your child to be intelligent, let his mother feed the little mite. It's much higher in fat than bovine for a very good reason. In fact the poly-unsaturates are a massive five times higher than in cow's milk. Not insignificant is that women who breast feed their babies have a much lower rate of breast malignancies too. Olive garden nutrition provides factual information about why monounsaturated oil is so beneficial particularly for nerves and joints. A comprehensive study, published in the American Journal of Clinical Nutrition (October edition), summarising the results of 11 different research projects involving over 7000 children, shows that breastfed infants tested 5.2 IQ points higher than formula fed infants. The reason why breast fed babies are more intelligent (and have better eyesight too) is an Omega-3 oil called DHA (docosahexaenoic acid) which is present in high amounts in mother's milk and generally lower amounts in infant formula. The best source is fatty fish. An astonishing 25% of the grey matter in the normal brain is made up of DHA. DHA is an "essential" fatty acid. Without it you would die. Without it your baby's mental growth would be stunted. The richest source is cold water fish. DHA can also be converted from another omega-3 fatty acid, called ALA found abundantly in freshly ground flax seeds. So the vegetarian can also get sufficient DHA. As an aside, every young woman should have adequate daily folic acid in her diet. If she is deficient, even before she knows she is pregnant because the neural tube is formed in the first weeks, she has a high risk of having a child with a very serious spinal cord disease or cleft lip. There's a simple solution which you can read about at spinal bifida and orange juice. Saturated fats come mainly from animal origins, though they occur in the plant kingdom too. Coconut oil is high in very nutritious saturated fats. Mainly however, they are found in meat, dairy products and eggs. Cholesterol is a saturated fat; and, in moderate amounts, is essential to health. The polyunsaturates are found in seeds such as from sunflower, maize and soybeans. They are very necessary; until they are hydrogenated, which is what is done to make a liquid oil into a solid fat that can be easily spread on bread, as with butter. It's complex, but in nature there are no trans compounds, which is what makes up 50 percent of margarine. It's my considered opinion as a chiropractor that margarine is bad for us because the body then builds nerve cells using totally foreign building blocks. Some new margarines are processed further so that they have less trans fatty acids. Again, the amount of cis polyunsaturated fat in mother's milk is a massive five times higher than that from the cow; it's brain food. The monounsaturated fats are found in the oil rich fruits, especially our humble olive and the avocado. In 100 grams of the following oils, these are the percentages, seen in the table below. Notice that olive oil nutrition, and avocado, is 74 percent monounsaturated fatty acids, which is much higher than the others. The first and immediate concern in cardiovascular health is that too much saturated fat increases the harmful, so called LDLs in the bloodstream. Note that all these vegetable oils, both those from seeds and those from fruits, are low in cholesterol. Saturated fats contain the LDLs that have been associated with the plaque that builds up in the arteries, narrowing their diameter, and hardening them, even more so when associated with smoking. This is called arteriosclerosis. High levels of LDLs are associated with high blood pressure, stroke and heart disease. Some saturated fat is necessary, but with caution. It's all about balance. On the other hand, low levels of HDLs are also associated with cardiovascular disease. Eating unsaturated oils like sunflower and olive oil do not raise the bad low density lipoproteins, like butter and meat do; but the great, and here relevant, advantage of olive and avocado oils is that a change to them will lower bad LDLs but NOT lower the good HDLs. Polys on the other hand do lower the levels of the health-giving HDLs in the blood, which obviously is not good. Enjoy a olive garden salad recipe every day; add as many colours as you can find, and of course some feta cheese, and our olive garden salad dressing; it's so easy to make. Something different and equally easy to make if you can get pine nuts is this recipe for basil pesto. Avoid the supermarket salad dressings; they are usually made from solvent extracted soybean and canola seed oils, and heaps of preservatives like EDTA, and colouring. Rather make your own with cold pressed oils and a squeeze of fresh lemon juice; slice a jalapeno into the salad if you like it hot. Having a fresh supply of your favourite herbs, lemon juice, garlic and chilies in your kitchen is the way to go; it's little effort, just some planning. Generally the Western diet is too high in polyunsaturated fats (read seed oils) and low in monounsaturated fats. Both contain some of the essential fatty acids, both are essential. Both are better than a diet high in saturated fat, read animal fat. New research from Tufts University indicates that just two tablespoons of olive oil per day makes a significant contribution to lowering the inflammation in blood vessels, reducing heart disease. Olive oil is better than seed oils which we are having too much of. Having said that, it's interesting that mother's milk is very rich in polys. Just as significant is that olive oil is almost entirely cold pressed and extracted these days, using high powered centrifuges, whereas the seed oils are predominantly solvent extracted, with much heat applied. Thinking more healthy fats? Then think olive garden nutrition. Fish oil is also an excellent source of 'essential' fatty acids. The polys are more unstable, and labile to heat, breaking down (oxidised) to harmful products, and frankly taste worse. Better to use less heat-labile fat to fry with: Butter (saturated fat) - assuming your cholesterol levels are under control, palm and coconut oil - and olive oil (high in mono unsaturated fat) are probably the best, though olive oil has a low flash point. So, monounsaturated and saturated fats (which are harder to oxidize) like extra virgin olive oil and virgin coconut and avocado oil are better for frying. Absolutely avoid foods that contain even small amounts of hydrogenated fats, since they contain "trans" fatty acids, and especially hydrogenated saturated fats; hydrogenated saturated fats are the fastest known way to get a heart attack. Ask, seriously, your fast food restaurant, "when did you last change your french fries oil"? If it wasn't in the last day or two, order a baked sweet potato. It's really difficult; baked potatoes have a very high glycemic index, read are very fattening. Dr AB Keys studied the levels of heart disease in seven different countries. While the research remains controversial, what is clear is that cardiovascular illness was lowest in Crete, where olive garden nutrition is promoted, and was ten times higher in parts of Finland. What is confusing is that Dr Keys used the study to promote his theory that high cholesterol is the cause of heart disease. However, his very own study showed that West Finland, with the same levels as adjacent North Karelia, had a much lower level of coronary illness, but still twice that of Crete. We have yet to hear the end of the cholesterol mono polyunsaturates story, but consensus has it that we should limit animal fat, and increase the use of olive oil. Thus we recommend moderate use of butter over margarine, because of hydrogenation. South African Indians are reputed to have the highest rate of heart disease in the world; smoking is widespread, as is obesity. They consume large amounts of omega 6 rich sunflower oil in their curries. It's now known that a high ratio of omega 6 to 3 in the diet is highly inflammatory. Tip: Olive oil on bread is delicious, if you are having cheese, salads or dips with your bread. 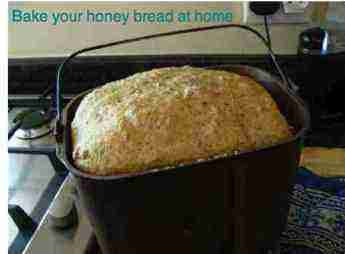 Not so good with bread and honey! The queen was in her parlour ... she uses butter rather than olive oil nutrition! "In the same way as the tree bears the same fruit year after year, but each time new fruit, all lastingly valuable ideas in thinking must always be reborn." whole grain cereals, like our Olive Bread recipe. 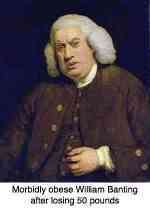 high consumption of olive oil. For more about OLIVE OIL BENEFITS, click here. If you want to go just a little bit overboard, then think too about grinding your own healthy flour; those fats are rapidly oxidised once the grain is cracked. Having freshly ground flour will really make your olive loaf, or low GI bread. Lentil Protein is one simple way to add legumes to the diet. This quick hummus recipe is probably our favourite though; the chickpea is the world's favourite legume; literally billions survive on it as their primary source of protein. The Mediterranean olive garden nutrition is probably the healthiest in the world. We love it with these kale benefits; ever heard of macular degeneration and cataracts? The people of the Med use the olive in 10,000 differing ways, but few more delicious and simple than olive pate. At any cocktail party, the pate will be finished down to the last smear. But why wait for a party? I try to make it several times a month. Only pitting the olives is a chore and a genuine resident of the shores of the Med will certainly turn up their noses at pitted olives. They taste and are different. If you've been pickling olives in a large tin, then by all means use them for your olive pate; both are so easy. Use a glass to squish them, thereafter you can rustle up olive pate in a jiffy; just a little tip from this olive garden nutrition page. To make low GI bread add extra fat and protein; I use olive garden nutrition and left over homemade hummus, just a rich source of vegetable amino acids. Bread and butter, or bread with an olive oil based spread has been a staple since time immemorial. If you are serious about your food, then think about baking your own bread; it takes only five minutes with the use of a bread machine. Grinding your own healthy flour is the next step to consider. That will take an extra minute or two. To convert a carb into low GI bread, one would normally add a fat like butter, but your olive garden nutrition is even better. Just the aroma of baking bread makes it all worth while; for less than ten minutes work, including washing the oven dish. We bake low GI bread at least four times a week. Avocados and olives provide most of the fruit oils, as compared to those from seeds like sunflowers and canola. Like the olive garden nutrition, the avocado is a fruit particularly rich in healthy mono-unsaturated fats. Plenty of it! Careful, it's fattening - one avo contains 2000 kJ.150-200kcals. The avo is also rich in water soluble fibre, so is good for constipation, just another good reason for it to find a place in our Olive Garden Nutrition parade, but because of its high kJ content I would recommend rather the beetroot constipation link and the apple diet for that particular misery. The avocado is full of iron and rich in vitamin E, a natural antioxidant. As one wag said, to stop the iron rusting! Total fat, even the healthy fats, should only be eaten in moderation. Believe it or not, they are fattening! The only exception is for babies who are fattening their brains, and interesting research being done on serious neurological diseases like ALS and Parkinsons. Sufferers will benefit from being on a high fat diet, with very limited carbohydrate to produce ketosis. For more about that, use these search words. TINGLING IN ARMS AND HANDS. 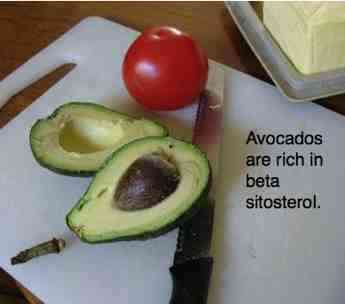 Avocados, along with tomatoes, are also prostate food because of it's beta-sitosterol content. Notice that butter is back. Dinkum! A powerful meta analysis of 80 research projects concerning the butter versus margarine saga concludes that there is no conclusive scientific evidence that changing to polyunsaturate oils has any benefit. Mostly, our motto at Bernard-Preston.com and Chiropractic-Help.com is Slow Food made Fast, but some healthy dishes just take time. 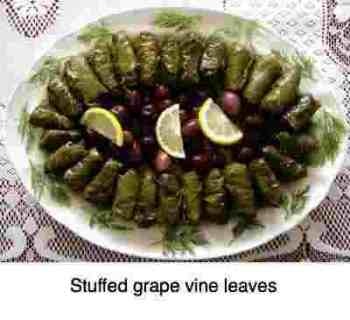 One is stuffed vine leaves but they are full olive garden nutrition. Make it occasionally. Your olive garden nutrition is predominantly made up of oleic acid; it's mono unsaturated as stated above, and thus very healthy, and is designated an omega-9 oil. Replacing your seed oils, which are high in omega 6, in salad dressings with olive oil helps to reduce that inflammatory omega-6/ omega-3 ratio. The oleic acid is also a vital part of the covering of nerves called myelin. Lose that fatty sheath and they can no longer conduct causing multiple sclerosis. Read more about this at our healthy flour page. 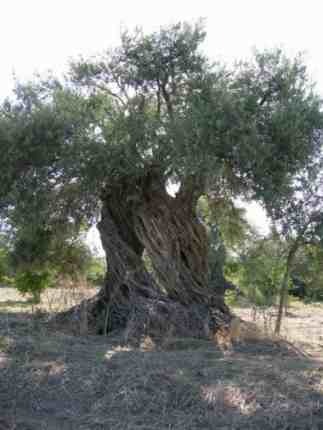 Oleocanthal is the active ingredient in olive oil that gives it its anti-inflammatory properties. I particularly love growing green beans; lightly blanched and soaked in olive oil and lemon juice, perhaps with a little garlic, they are to die for; just another legume from the olive garden nutrition way of life. If you are growing green beans then choose the pole variety; easier on the back and bear for much longer. Limas, broad beans, green peas... they are all legumes, containing starches that have a very low glycemic index, and are totally desirable in the healthy diet. One of the fads is that our diet should be extremely low in starches; forget Adkins and Banting because the low GI legumes in the olive garden nutrition are extremely healthy; it's the high glycemic index carbs in refined bread, parboiled rice and sugary treats that we should be avoiding. 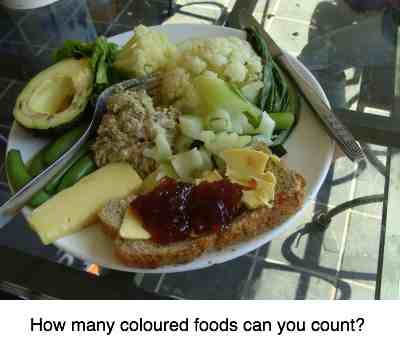 Read more about glycemic index calculator, using site search. Quick hummus using your your olive oil is a breeze; I make a tubful several times a week; without chemical preservatives it tastes so much better, but finish it within a few days. The excess goes into our low GI bread to bring down the glycemic index of the wheat; not that you need be concerned if you're using healthy flour. Hummus turns a boring green salad into the food from the gods. It's full of chickpea, sesame and olive garden nutrition. Your quick hummus uses a spice you may not be familiar with; what is cumin? The freshly ground powder can be very nicely stored under this specialty from the olive garden nutrition; in any case you add plenty of olive oil to your hummus, so it's no problem. And here's a quick easy pesto recipe, also of course with extra virgin olive oil; make it in only ten minutes. Chiropractic means a healthy nervous system and that means oleic acid; it's the main ingredient of olive oil. Nerves are coated in myelin which is mainly made of oleic acid. PESTO ... so easy to make at home.